If you are holding a reliable patentability search and opinion in your hands and the indicators are pointing up, there's a very good chance your idea is patentable. That's exceptional! Congratulations! After you have reviewed, assimilated, and discussed the results of your patentability opinion with your patent attorney, you will have enough information about your idea to make some informed decisions about the direction of your invention. Having that information can give you a real sense of accomplishment and power. From this point until your product is selling, you get to feel power and accomplishment... umm... not that many times. So enjoy it! File A Provisional Patent Application... Now??? Yes. At this point in the invention process, if you haven't filed a provisional patent application, do so. Although most inventors file the provisional patent application prior to doing a patentability search and opinion, I prefer doing the provisional patent application after receiving the result of the patentability search and opinion. Why? Because your patent attorney now knows what you can claim as new, and that gives you the opportunity to tweak your original idea or completely change facets of it before you commit to your claims. 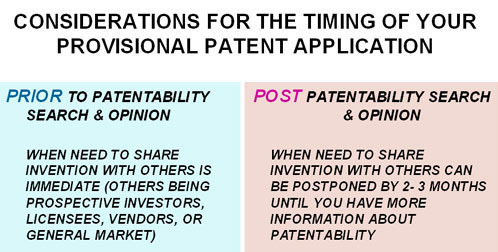 In any case, even if your intention is to immediately proceed to a full patent application, file a provisional patent application now, with your attorney's help, because the non-provisional application will take more time to prepare. You will be able to claim the earlier date if you do file, and even if you don't file you will be able to use the patent pending status while you prospect for licensees, vendors, or others involved in marketing issues. A positive patentability opinion can offer a big boost to your marketing opportunities and potential value of your invention. 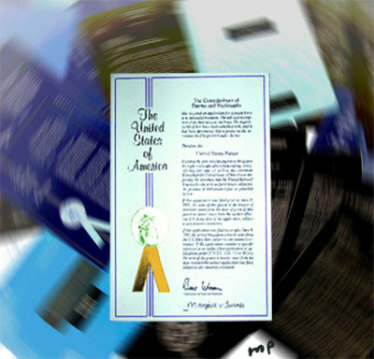 First, although the opinion is confidential from your attorney to you, you may choose to share it with prospective investors or licensees (with a signed non-disclosure statement that offers mutual protection... your patent attorney will have one), to encourage their interest in becoming involved in your invention. If you are desirous of licensing your invention to another business, that company would be more likely to contribute financially to your patent application if your opinion is positive. Additionally, your negotiation leverage will be stronger with a positive patentability opinion. Once again you have given a concise and informative article. I look forward to your next part in this series. Keep up the great work! Roger.. It's great to hear from you! I haven't forgotten a possible joint venture! Thank you for your very kind words! That should really help answer the questions about patents. It's amazing how much info you can find today on the web when you put some work into research. Thanks again for the information. Thanks for those kind words. I read your piece on "how to come up with great product ideas." It seemed like I was reading my story on how I started. You mentioned how you solved a problem in your everyday life and created the sock. It's something we do everyday that makes it our idea playground. I solve problems like you because I looked at expensive prescription glasses and notice that people misplace them and ask myself the question. Who finds these glasses and can they return the glasses. I had a draw of glasses I found on the streets on NYC and thought about how to return them. I came up with a product called EYE-D .
Like you found while setting up your demo booth when the sales person told you she had that idea. I always tell people that it takes 100 steps to getting invention to the market and most people stop at step 3 and real inventors take it to 100. Any time you start something you must finish it and what's the worst that could happen is that you know more about the subject then you did before!